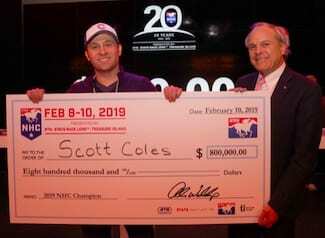 If Scott Coles wanted to leave the 20th NTRA National Horseplayers Championship (NHC) with the $800,000 first-place check and an Eclipse Award to his name, he figured that acting like the best handicapper in the room wasn't going to cut it. He had to play fields that weren't obvious attractions. He had to focus on picking winners and not get hung up on odds. He had to find a way during his first ever try at the NHC to stay one step ahead of those who had been there and done that. Coles' plan worked to perfection when it counted most. A longshot pick in the next to last mandatory race at the 10-person Final Table propelled him to the front of a tight leaderboard en route to earning the title of 2019 NHC champion with a mythical bankroll of $367. The upstart Coles toppled an NHC field that had 668 entries, second largest in NHC history, and 522 individual players. This year marked his first time qualifying for the NHC and he became the tournament's youngest ever champion when his total bested runner-up Jim Meeks by a margin of $10.40 in a Final Table showdown that featured four lead changes in seven races. 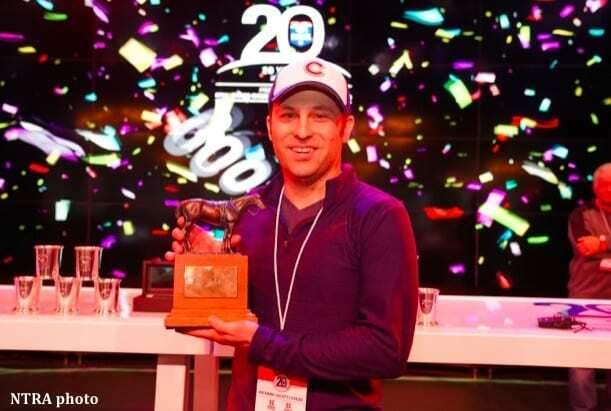 Coles, a full-time futures trader for a firm, said he only began playing the races about seven years ago and really got serious during American Pharoah's Triple Crown year in 2015. He began focusing on tournaments the last two and a half years and got dual qualified this summer on back-to-back weekends in a pair of HorsePlayers.com online tournaments. “I started playing the (NHC) tour at the very end of 2016. Didn't qualify. Tried last year on and off, didn't get there,” Coles said. “This year I was fortunate to get double qualified. Navigating through (the NHC) was interesting. There were a lot of nerve wracking moments. Gallo, who made a massive charge on Saturday to sit second heading into Sunday's semifinals, earned his highest NHC placing ever when he finished fourth ($337.40). Simonovic ($327.20) was fifth followed by Joe Perry ($324.40), 2018 NHC champion Chris Littlemore ($298.40), Robert Gilbert ($297.40), Marshall Gramm ($276.90), and Frank Drew ($268.80). The 2019 NHC finals awarded cash to the top 67 finishers (the top 10 percent overall) from a total purse of $2,863,000. An additional $50,000 went to the top 20 in today's Consolation Tournament, which was won by TVG racing analyst Dave Weaver. This entry was posted in Horseplayers, NL Article and tagged chris littlemore, frank drew, Handicapping tournaments, Jim Meeks, joe perry, Marshall Gramm, Matthew Vagvolgyi, national horseplayers championship, NHC, NHC Tour, NTRA National Horseplayers Championship, Racetrack Television Network, Randy Gallo, robert gilbert, scott coles, STATS Race Lens, Treasure Island by Press Release. Bookmark the permalink.